Major League Baseball has submitted a proposal to the Treasury Department that outlines a new pathway for baseball players from Cuba to sign directly with big league teams in the United States. If approved, it could represent a sea change in relations between the two countries and drastically reshape how Cuban players find their way to the major leagues. For decades, Cubans have had to play for minuscule wages — now $40 to $200 per month — or defect from their island homeland to pursue baseball careers in America. A Cold War-era embargo that only Congress can remove is still in place and largely prohibits American companies and citizens from doing business in Cuba. sounds great and can only encourage the opening up of the island more generally. damn shame that people excelling at their national sport have to defect to make $$$s. Ceremonial first pitch honors will be shared by two great Cuban right-handed pitchers: Pedro Luis Lazo, a longtime standout for the Cuban National Team and Pinar del Rio, and Luis Tiant, a three-time All-Star during his 19-year Major League career. Lazo, 42, pitched for Pinar del Rio of the Cuban National Series from 1997-2009 and was a longtime star in international competition, earning two gold medals (1996, 2004) and two silver medals (2000, 2008) in the Olympic Games. He also recorded a 4 2/3-inning win in relief in Cuba's Semi-Final victory in the inaugural World Baseball Classic in 2006. Tiant, 75, was a three-time All-Star and a four-time 20-game winner during his 19-year Major League career, most notably with the Boston Red Sox (1971-78) and the Cleveland Indians (1964-69). 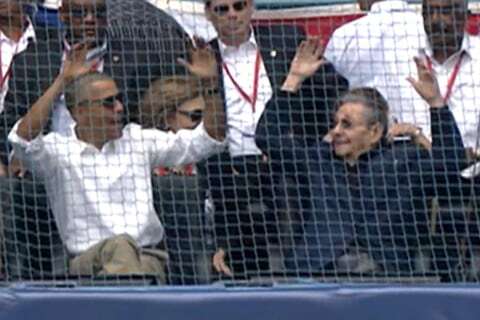 I saw Lazo pitch in Pinar del Rio when I was there in 2004.
who is sitting w/ Obamas? Cuban defector Yulieski Gourriel has been declared a free agent by MLB. Still, the Post's Joel Sherman is skeptical the Mets will pursue Gourriel. Sherman writes: "Though they traded for and ultimately signed [Yoenis] Cespedes as a free agent once in the States, the Mets pretty much have shunned the expensive Cuban international market. Two club sources said they would be surprised if that changed, but would not definitively rule out Gourriel." Sherman expects the Yankees to be involved.